Affordable Accoutrements: Party of 14? Right this way! It’s time for another Tablescape Thursday with Susan of Between Naps on the Porch! You know what to do … dash on over and see what our gracious hostess has prepared for us today. Be sure to visit all the other participants. The tables are set, and they’re waiting to entertain us! Last week I showed you “China Carnage.” I had purchased a large set of vintage china, “Essex Maroon” by Lenox. Eleven of the twelve cups & saucers became saucer-less due to a difficult trip through the mail (and the absence of bubble wrap, packing peanuts, and double boxing). I did eventually manage to replace the broken saucers. You can read about it HERE. I believe I mentioned that I would set an “Essex” table for you ... and now I have. I couldn’t decide whether to make it a table for two in the breakfast nook, or for six in the solarium ... or perhaps in the dining room …. It was an extremely difficult decision to make. So ... I've prepared all three for your visit! I kept it simple (but shiny!). I showed such restraint that you won’t find a single swan, or cherub, or Christmas ornament, or Bible, or family photograph, or feathery wreath! 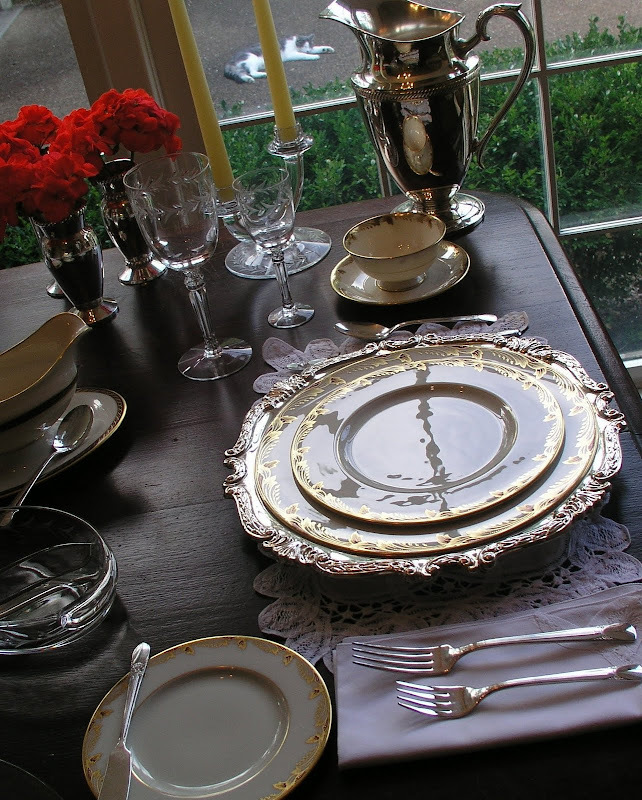 Without planning it consciously, the china, crystal, and flatware all turned out to be from the same period, 1938-1942. The Art Deco period was winding down, and the romanticism of the 1940’s was beginning. It’s a look I enjoy … less ornamentation than during the Victorian Era, but more elegant than the 1950’s Danish Modern/Space Age look that followed. The second half of my life will be black to the white rind of the old and fading moon. and who my friends are. this imprint of my own desire. the beckon of open road. and old letters into the grate. The cut flowers came from this garden and from a vacationing neighbor's. I consider it pro-active deadheading (liveheading?) to help insure new blooms for her homecoming. Did that sound convincing? Seriously, she always says to "help yourself to whatever's blooming!" The vase in the solarium is "Cape Cod" by Imperial (1932-1984). I lined it (and the heavy crystal compote in the dining room) with large hosta leaves to hide stems of the flowers. I used clusters of shrub roses and of marigolds as "flower frogs" to hold the stems in place as I added single blooms to these casual arrangements. That "dinner plate" dahlia is showy, isn't it? The three small silverplated vases on the "table for two" are by Pottery Barn ... via Goodwill. The made-in-India silverplated candle holders in the solarium were clearance Christmas items from Hobby Lobby. Place mats and napkins are from estate and yard sales. I mixed in a different Lenox pattern for the serving pieces. The covered casserole, sugar/creamer, and gravy boat are "Monroe" (1983 - 2003). The silverplated bread tray in the dining room is "Versailles" by Gorham, $1.99 at Goodwill! Next week? I'm leaning toward a tea tray ... for ONE! How does that sound? Beautiful tables ... beautiful words! Looks like something right out of one of my favorite classic movies. LOVE LOVE LOVE! Love the silver chargers and LOVE the chandy! A+ as always! I could not choose a favorite, ever.I adore each table setting so much. These are from one of my favorite time periods. Each one brings back fond memories of wonderful meals at one or the other of my dear aunties' homes in San Francisco as I was growing up. Excellent presentations, as always! It's such a treat to come visit you. Gorgeous tables, Bill...I love them all! 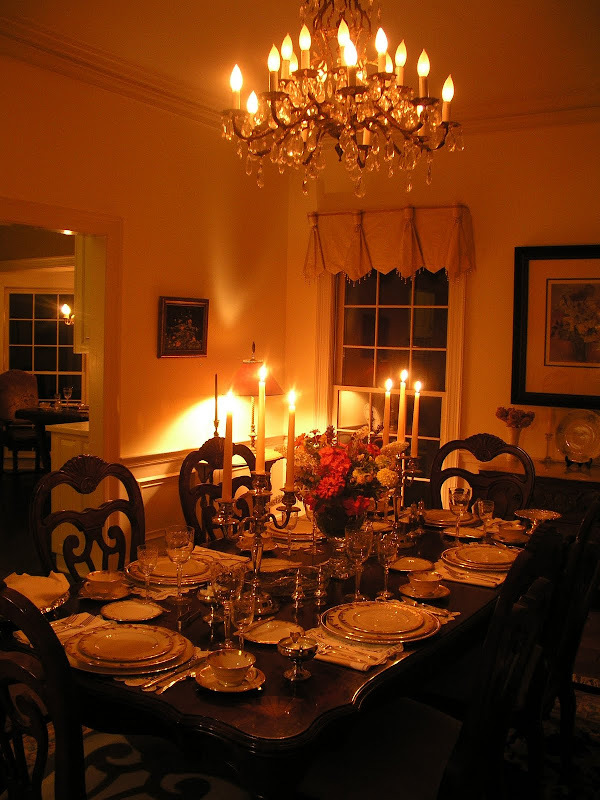 I think my favorite one has to be the one in the dining room with all the beautiful candle light! Your chandelier is stunning! Ok, I know I'm supposed to be looking at the tablescape. :-) I'm stealing your idea of lining the vase with leaves to hide the stems...love that! And love your floral arrangements! The Essex china is just beautiful...now you know we'll be expecting 3 tables every week from here out. This is ---oh----so----beautiful! 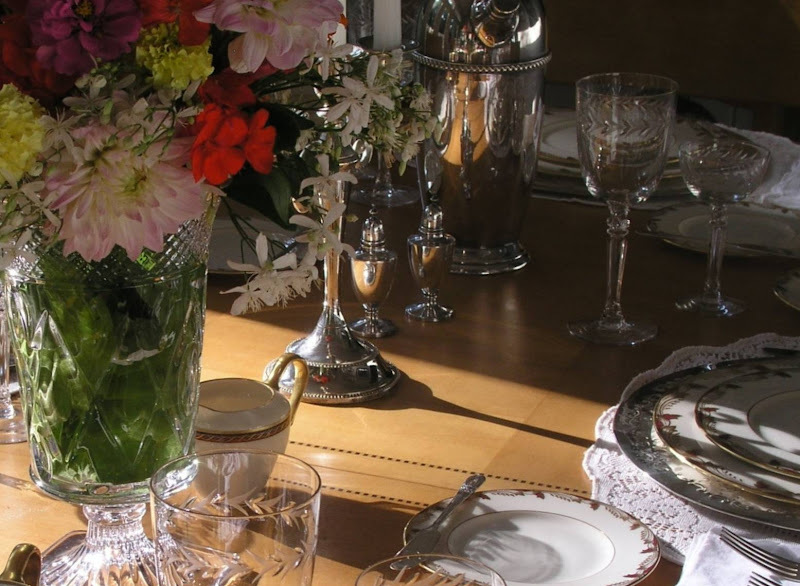 And the lighting is amazing -- and the flowers -- and your china --- and the table linens -- and well just everything! I couldn't choose one to love the most -- so I think I'll join you at all three tables - I'll bring the wine! Beautiful poem and just as beautiful china. As I was looking at your pictures I noticed a few other things. The cat for one. That is too fuuny to see a fat laying stretched out on the driveway! The second thing I noticed was the tail lights of the car. Are you the proud owner of a Lincoln Town Car too?! Mine is a few yrs older....1995. I love me a luxury car ;) What a nice neighbor to let you help yourself to her beautiful flowers. Wow. I'm jealous ;) I hope you have a great holiday weekend. Gorgeous table and love the colorful centerpiece! Very beautiful how you changed the lighting as the poem moved on. Isn't is hard to stop once you start? So lovely! Beautiful tablesettings. The china pattern is one I have never seen before and is gorgeous. I think my favorite table was in the dining room also. BTW, I have used hostas many times to line a clear glass container. I did a huge arrangement for a big Hospice event not long ago and the container was clear glass sitting in a three ft. tall old iron piece. I lined the glass with hostas and did a huge arrangement for the serving buffet table using all tropicals. You had me on the first photo just reading the poem and loving the tables! They all are very elegant! The china is beautiful and all the pieces you have chosen! This is a Big Wow! Love the silver! 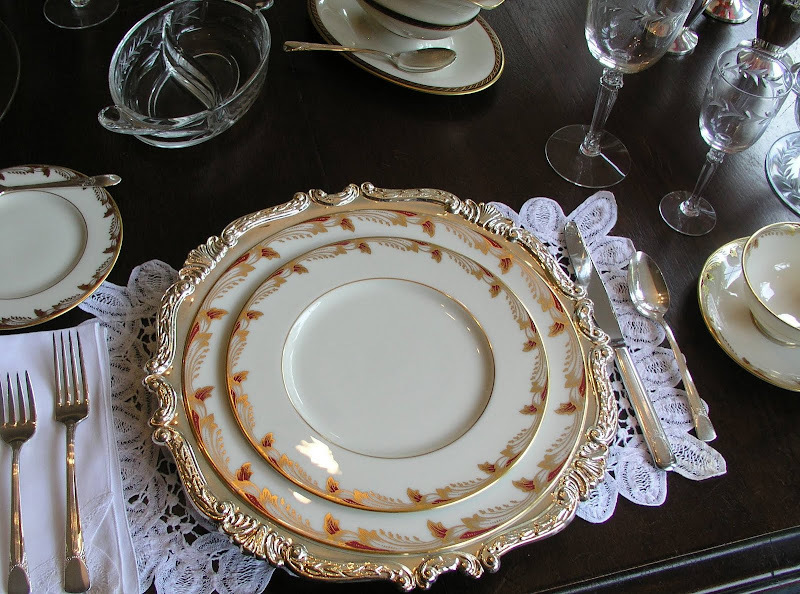 The crystal, the lace placemats! Love the story of you stealing the flowers. lol I sure she loved it! Now when she comes back she'd love to sit at one of these tables! I love you use fresh flowers. Wish I was closer to town. Everything here is about gone. Where oh where to begin, everything is so beautiful, the THREE settings all great. Your home is so elegant, your photos have a professional quality, the reflections, the lighting, the poem. Not to mention the flower arrangements and the china and silver, oh the whole post is stunning....what delish eye candy!What a great post~it is no surprise your blog is taking off like wildfire! Okay, again I can't look at the tablescape because I'm too distracted by your beautiful home! Floor to ceiling windows. Beautiful! Fireplace. Beautiful! Crown molding. Beautiful! Chandelier. Beautiful! Wainscoting. Beautiful! AND white kitchen cabinets! Do not tell me you have the kitchen of my dreams too! Okay, let me go concentrate on the table now. The tablescapes are fabulous. I love it simple without too much decoration on the table. Thanks for sharing your sparkling china! Oh, my! This is having your cake, and eating it too!! I became excited when you said you would do all three settings! Gorgeous! Gorgeous! Gorgeous! The poem is the icing on the cake! Really more than pretty tables! 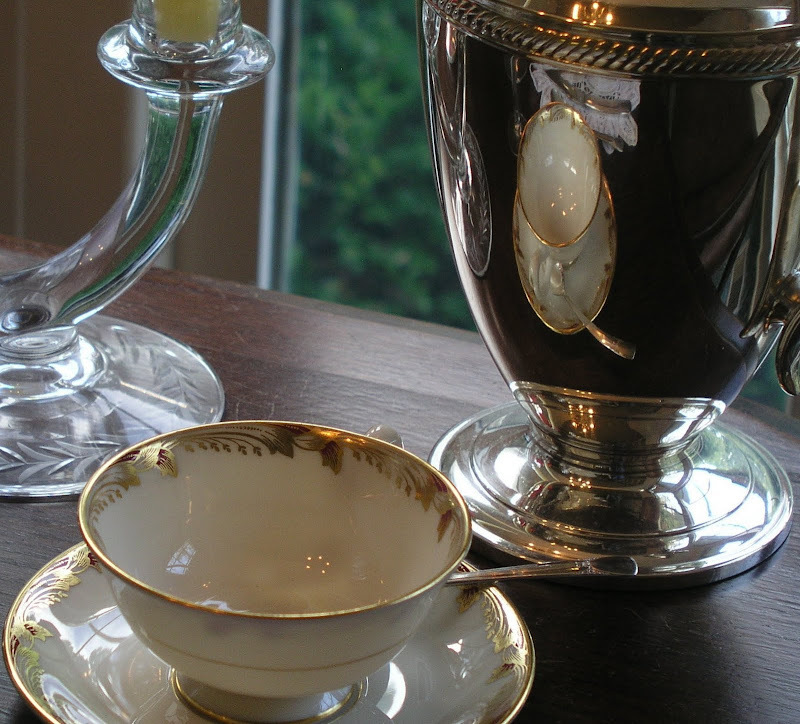 I love the delicate pattern of both the crystal and the china. I love the white lace against the wood. I love the cup reflected in the silver pitcher. I love the beautiful chargers, all of them! I love all the flowers, I love all the vases, and I love the cat outside the window! And I loved the poem and how your post went from dawn to dusk. The lighting in both is stunning. Beautiful table, I don't know which would be my favorite. I know I would enjoy a meal at either of the three. Everything was just perfect. Fabulous post and tablescape, Bill! It looks so classy, warm and inviting!!! Wonderful...all three. The china is just lovely. I am enjoying your posts and your wonderful talent. Thanks for the mini flower arranging lesson. Most elegant, enjoyed the wonderful photography. The lighting was amazing in all the shots, good job! Wonderful! I loved the poem and the tablesettings. I especially loved how the color of the plates seemed to change depending on the light. Kind of like the life in the poem. Just fabulous! Man you brought back memories! Good friends of my parents had that set of Lenox. I can remember many a wonderful meal upon those plates. Thank you so much for the memories. So very nice; everything is exquisite. Such a talent you have! Gorgeous pics, as always, Bill! I'm LOL about you "liveheading" the traveling neighbor's flowers! I think a tea for one sounds great. I love doing little 'scapes for one or two. Absolutely breathtaking.... not once but thrice. Your tables are stunning and your photos are as amazing. I wish I could take photos like yours... you are truly gifted in the art. Bill you have out done yourself. I think this is my favorite so far. I love, love, love this table setting. This just proves that less is more. The last picture was of my view of the table. 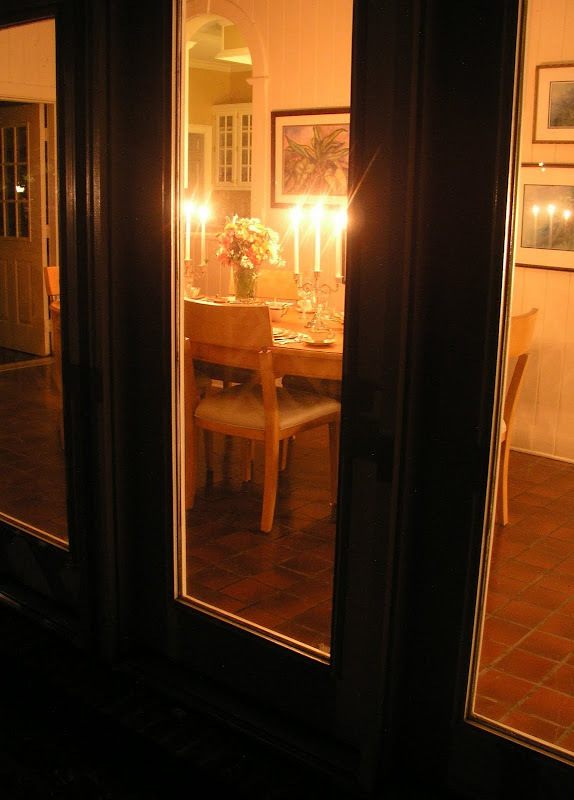 Outside with the kitty cat (I saw him stretched out there) scratching at the door to get in and enjoy dinner at that table. This setting is so elegant. I love the reflection of the cup and saucer in the water jug. Very artistic. Your tables have achieved elegance in their simplicity. Each has a special something that sets it off. Your photographs are wonderful...how did you get your kitty to pose through the window? Thank you for once again showing us how to achieve elegance. Everything is just so beautiful I don't know where to begin. You're attention to detail and thoughtful placement is extraordinary. Your tables aren't just settings, they are truly works of art. Your ability to synchronize a beautiful poem with your table is an indication of not just someone with a passion for decorative arts but one with a talented soul. I really loved your table and thank you for this great inspiration. It's beautiful Bill. The table settings are gorgeous, and the flower arrangements simply stunning. Great work - as usual! I hope you can stop by and enter your name in the giveaway at Color Outside the Lines. I know you could do some fantastic things with the loot! :) Cheers! Absolutely beautiful!! I cannot possibly pick a favorite, even though the China made my eyes water with glee!!! The poem was made for these moments in time!! Have a beautiful day and thank you for making my day better by seeing this!! Bill, once again you have outdone yourself. 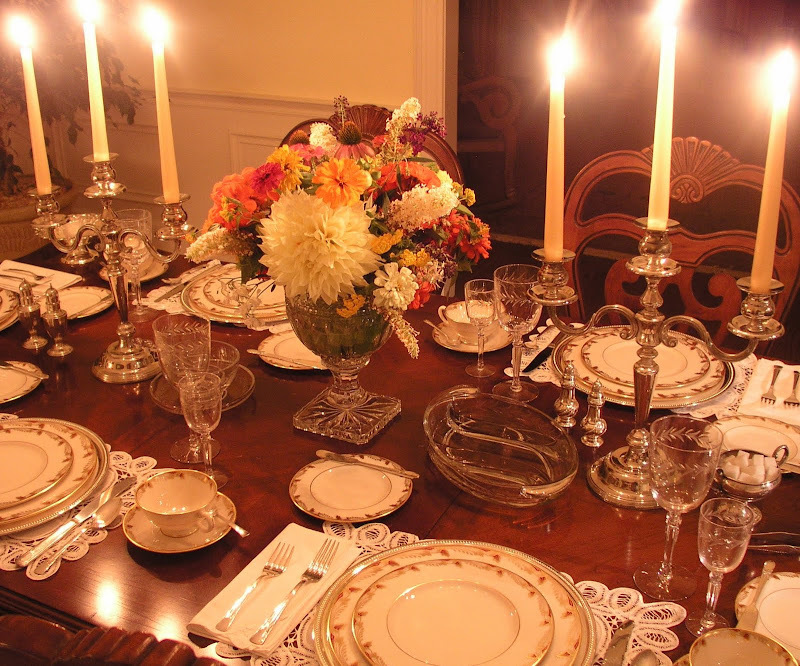 What lovely tablescapes, and the poem was so beautiful it made me teary. Kudos, my friend. Not only are you eloquent with words, you are eloguent with tablescapes and a fine gentleman to boot. Mr. Magpie agrees. Breathtaking!! Words cannot express how beautifully you have captured the elegance of your tablescape but the poem you have chosen comes close! Everything is fabulous! thanks for sharing it, love Jackie. Truly you are an artist. Your tables are your canvas. Your placesettings, decor, and beautiful flowers are your paints and brushstrokes. (I think I read in a past post that you did some paintings, no????) It is evident that you envision... and then go at it! Your photograpy is amazing...are you also a professional photographer? Your tablescapes are awesome work. -I liked the kitty out the window too. - I use greenery in vases to hide ugly stems! In very skinny tall ones, I have even used variegated liriope. Thanks for sharing. Where to start? Well, you know it's all gorgeous right and so many ideas & tips to borrow/steal? Especially lining a vase with hosta leaves, that's inspired. Oh, and will you please stop rubbing it in about the Gorham tray!Mon Dieu! Proactive dead heading..LOL! Stunning tablescape and dining room set. I love the mix of vintage dishware and glassware. 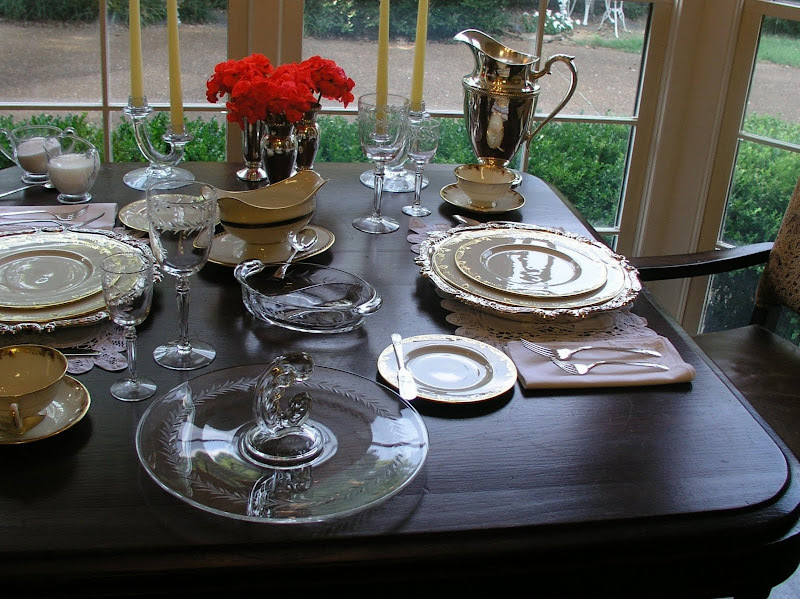 The clear depression glass pieces are so elegant with the dishes. I was trying to decide if I would consider the dishes to be "wedding ring" china, and I think that I would. The silver on the table is a perfect touch. Hi Bill...your tablescapes are always stunning. I love the placemats and all the silver. I didn't get a tablescape out this week...maybe next. Have a good rest of the week and enjoy those beautiful flowers!! The poem is lovely and the tables gorgeous. The photo of the reflection of the cup in the pitcher is exquisite! As usual, a great post and as usual, I love it all! Beautiful post and beautiful poem. Everything is lovely and just so classic. Loved the china, the florals, the linens, and the silver. And the kitty lying outside the window, too. What was NOT to love? Five stars!! Bill, you're a master of tablescaping! The photos are magazine-worthy. The elegance is inescapable. And I'm impressed as always when visiting your home! *GASP* Bill, I followed your comment on Karen's site "somedaysarediamonds" & I am just speechless over what you are able to do with dishes!! My eyes just dance over the tablescapes you've created & I drink...no, make that GULP in the details like I've been dying of thirst. You inspired me to go to our local Goodwill this morning & I found a darling little white scalloped milkglass compote that will play well with my Mother's antique scalloped candy dish & a new white Ralph Lauren cake pedestal that I just purchased. Thank you for sharing your exquisite ideas & talent & for giving all of us a chance to experience your artistry! Truly a joy to behold. I must ask you, though....WHERE do you store all of this stuff??? BEAUTIFUL tables. I just love that china! LOL..about your neighbors flowers, I'm sure she'll appreciate your dead (live) heading. Bill--I love too many things to name them individually! Did I miss something--What are those gorgeous chargers? This is ready for a truly elegant dinner party fit for royalty! Did you at least pick up the mail while you were stealing...I mean, liveheading the flowers :)? Thank you so much for sharing the images!!!!! I loved Crossroads and I think it is such a good idea to put a verse between pics!!! You made a wonderful tablesetting. Congratulations. Oh, I had to stop and take a second look. The first table I just love. I know they are all beautiful, but that pulled me in! Maybe the poem? lol Bill you can certainly join us, and for only male at the table you will not be! For some are bring their husbands. Then there is so many places to shop, and Saturday you could go to Philadelphia, Carthage all the small towns in between and shop! There is a great event on Saturday, near Hattiesburg in Richton, MS I did not realize it was the same date. I use to go and find lots of old antiques. But I spent most of my time on demonstration of spinning and weaving. Check your Calendar! We would love to have you! Miss Debbie, is northeast of Memphis has a tea room she just Emailed she wanted to come, but she has a group booked that day. Wow, Bill! I love the crystal vase and could tell you had lined it with something and yes, that Dalia is showy. I want to play dishes with ya'll soon. A few of those chargers are stunning. I posted today about a watercolor that reminded me of Duck Town, TN...have you ever heard of it. It is right outside of Chatanooga on the way to North Carolina. Anyways, we stayed at a lake there several yrs ago. I was ready to move in!! Hi Bill, I can't believe that you pulled off 3 stunning tables! That is sheer talent in itself! I would also like to add that I like seeing your serving pieces too...I can just imagine the food...wonderful post! So beautiful and sophisticated. I would give anything for a spot at this table. I can only imagine the conversation. If tablescaping can be art...you accomplished it! Just beautiful! I love all the silver (especially the chargers). The center piece is lovely as well. Just give it a nice pop of color and ties everything in. Beautiful and elegant. I love those silver chargers on your table for two! The china is simply gorgeous. I cannot stop looking at these pictures. I have visited three separate times and I am not done yet! Beautiful is just not a stron enough word! And the glimpses I have caught of your home in these pictures shows such elegant taste. Bravo to you!!!!! By the way, I love your cape cod vases. I have an extensive collection, but no vases!